Rapt Studio gives PayPal‘s West Village offices a presence that incorporates their brand story and emphasizes collaboration and flexibility. PayPal has grown its brand and New York City presence over the last several years, and Rapt Studio worked with them to expand their West Village presence by emphasizing the company’s stories of consumer partnerships. 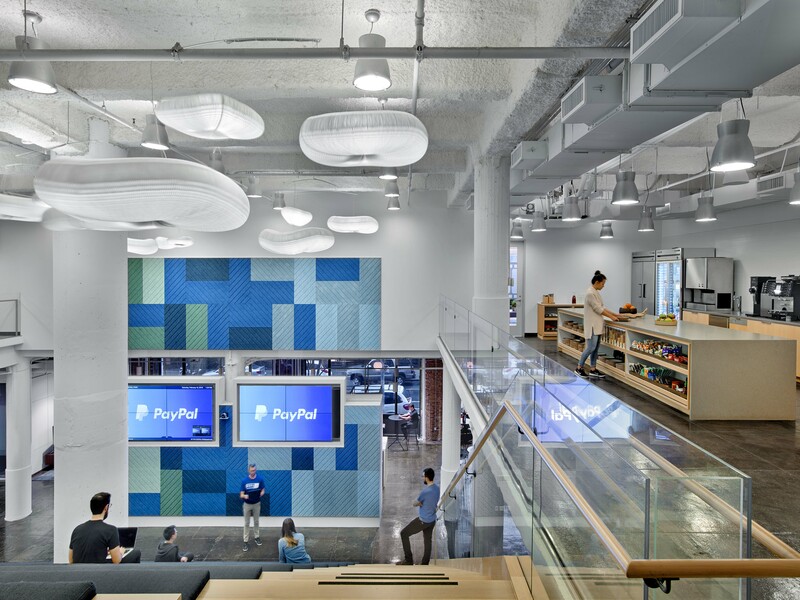 What was once a loading dock and freight elevator lobby has been repurposed as the company’s main entry, announcing PayPal’s presence and leading to a state-of-the-art experience center, which sits side-by-side employee gathering and meeting areas. The space covers two full floors of open and collaborative workspace and highly flexible gathering spaces. Reception greets employees and visitors. Lounge areas provide space for impromptu meetings. Graphic displays integrate the PayPal mark. How many employees/average daily population? Several structural bays were removed between the first and second floors, allowing Rapt to outfit the space with a sweeping stepped bleacher. Here, presentations and large all-hands gatherings take place. Through the use of integrated technology, global company-wide presentations and product launches are now possible. Above and overlooking the all-hands area is a café with seating that allows for smaller impromptu meetings. The space hosts weekly events and encourages employees to build community, whether through making an espresso or celebrating a win during happy hour. While the workspace on the upper floors embraces a bright and playful material palette, lower levels are finished with a more refined and mature palette, balancing PayPal’s brand colors of blues and grays with light woods and brass. Cloud-like pendants float above the stair for a bit of whimsy, while a large-scale patchwork pattern does double duty on the presentation wall, acting as a large-scale artwork while absorbing sound. A long travertine bar with a brass grid of suspended shelving and lighting anchors the communal area at the base of the all-hands area. The bar creates a special moment not only for PayPal employees and partners but also for visitors and passersby who can see the activity within the space from the street. This space hosts weekly interactive events and encourages employees to build community throughout the day, whether it’s through making espresso for a co-worker or celebrating a win during happy hour. The open plan is designed for a variety of uses. The stepped bleacher is where presentations and all-hands gatherings take place. Rapt incorporated PayPal’s colors of blues and grays, as well as its logo. A café upstairs overlooks the main bleacher. A long travertine bar with a brass grid of shelving and lighting brighten the kitchen.